Game Boys captain Leroy Jackson may have lost out in the pairs $10,000 winners' domino prize in 2012; well, he had the opportunity to receive the cheque of $10,000 and championship shield from Belfast Estate Ltd Sales & Marketing Manager Hyacinth Durand Ducreay as the first champions of the Red Cap Rum 4-Hand Domino League at Krazy Kokonuts on Saturday night February 23, 2013. Game Boys of Portersville defeated Burton's Eagles by 314 points; that is, Games Boys 4,001 to Eagles 3,687. Mrs Ducreay also presented cheques of $2,500 to losing finalists, Eagles and $1,500 to third placed Dolphins. Lagoon who lost their only match at the semi-finals stage to Eagles were a no show at the conclusion of the league which commenced on October 7, 2012 with 30 teams which played in four zones. The top 16 teams moved on to the knock-out phase of the competition. Game Boys took care of Marinor Rangers 4,029-3,565 at the quarter-finals stage, and then beat Dolphins 4,013-3,169 in the semi-s. Eagles took out Tremors 4,021-3,248 in the quarters and Lagoon 4,001-3,784 in the semis. 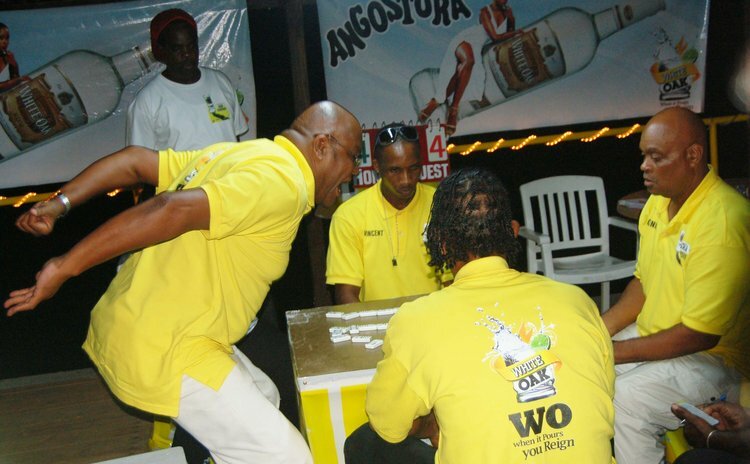 Ducreay who revealed that about $26,000 was invested in the Red Cap Rum competition. He told The SUN that repeating the competition would be more a question of frequency, whether every two or three years and that was being considered. But for her company, the first order of business would be the establishment of a domino association.